Christmas is a time for family. Spending quality time with loved ones is something we all wish we had more time for and we can often be guilty of neglecting traditions due to our fast-paced way of living and digital age. But this winter, why not move away from technology and invest in some wholesome and cheering entertainment to keep the whole family amused for hours? With a growing school of thought thinking it best to move away from time spent in front of screens, classic products such as boardgames and puzzles can help you relax as a family and provide endless hours of entertainment. Addiction to gaming and the excessive use of smart phones, televisions and the web is now recognised by the World Health Organisation as a disorder, which can lead to stress and significant impairment in day-to-day functioning*. With this in mind, never before has it been so significant for families to understand the importance of time spent away from screens and what better time to encourage both young and old alike to ditch their technology, than at Christmas? So rather than sitting down to watch a film together, sit down and interact over a game together. Compete with your cousins, side with your sister or ally with your auntie. Afterall, what better way to bond than over a boardgame? This festive season keep spirits high by focusing on fun that the whole family can enjoy together. Ryman Stationery understand the importance of time spent with loved ones and have a huge range of games and puzzles to suit you and your nearest and dearest. So, whether you opt for a mind-boggling war of wits or favour a fun and light-hearted game of cards, there’s something to suit everyone this Christmas. Using our imagination allows young and old to be as creative as we might dare. For those of you who love fantasy lands, why not tap into your favourite characters with an interactive game and immerse yourself in their world? Winter is coming. Play detective with this Game of Thrones Cluedo (£22.99). Find clues and use your wit to discover ‘who dunnit’ in this modern twist of the classic investigative game. Could it be Jon Snow, Daenerys Targaryen or perhaps the Hound? Only time will tell. Are you a joker like Joey or more of a Monica? Put your knowledge to the test with this Friends Edition Trivial Pursuit (£8.99) and discover who the true Friends fanatic of the family really is. 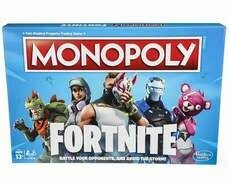 It’s the online video craze that has seen youngsters go mad over but coax them off their screens with this Fortnite Monopoly Board Game (£24.99) (while stocks last) instead. A far more family-friendly version of the popular fantasy game, claim locations, battle opponents and survive – the last player standing, wins. Just make sure to play fair! Know your witches and wizards from your muggles? Are you a Gryffindor or Slytherin? Let the games begin with Harry Potter Scrabble (£26.99). Perfect for fans of the books and films, this version celebrates the wonderful and enchanted vocabulary from the magical world of Hogwarts and beyond. For a sweet stocking filler, why not treat a loved one to this charming Roald Dahl Top Trumps Card Game (£4.99)? A fun and educational game for the whole family, compare your favourite characters to each other. Whether Matilda, James and his Giant Peach or Fantastic Mr Fox, this is perfect for playing at home or whilst travelling to see relatives. Puzzles are a great way to create a calm and soothing environment. Christmas can be chaotic so making time to spend piecing together a puzzle is a fabulous way to unwind with the family. Create an aura of mystery with this magical Fantastic Beasts 1000 Piece Puzzle (£12.99) (available instore). For every witch, wizard and beast amongst the family, to keep you all enthralled for hours. Do you have a Disney fan in the family? 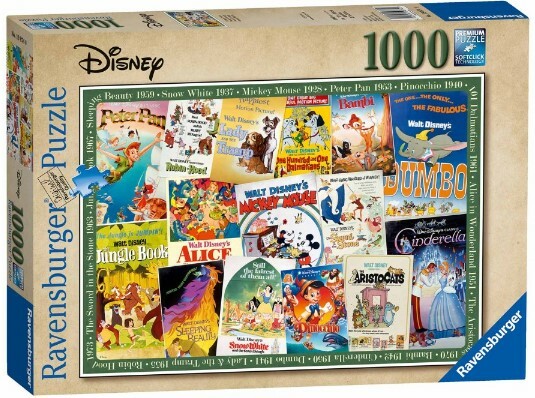 The Ravensburger Jigsaw Puzzle Disney Vintage Movie Posters 1000 Pieces (£11.69) brings to life 60 years of fairy-tale Disney movie posters. Whether you are mad for Mickey Mouse or a grown-up Peter Pan, you’ll love creating your own work of art. To ensure your work in progress is kept immaculate, why not add one of these Puzzle Mates Puzzle and Rolls Jigsaw Mat (£8.99) to your constructions? Both a perfect surface for creating jigsaws and a protective storage capability, this will ensure your puzzle is left in-tact and ready to complete when you come back to it. No missing pieces or broken parts in sight! 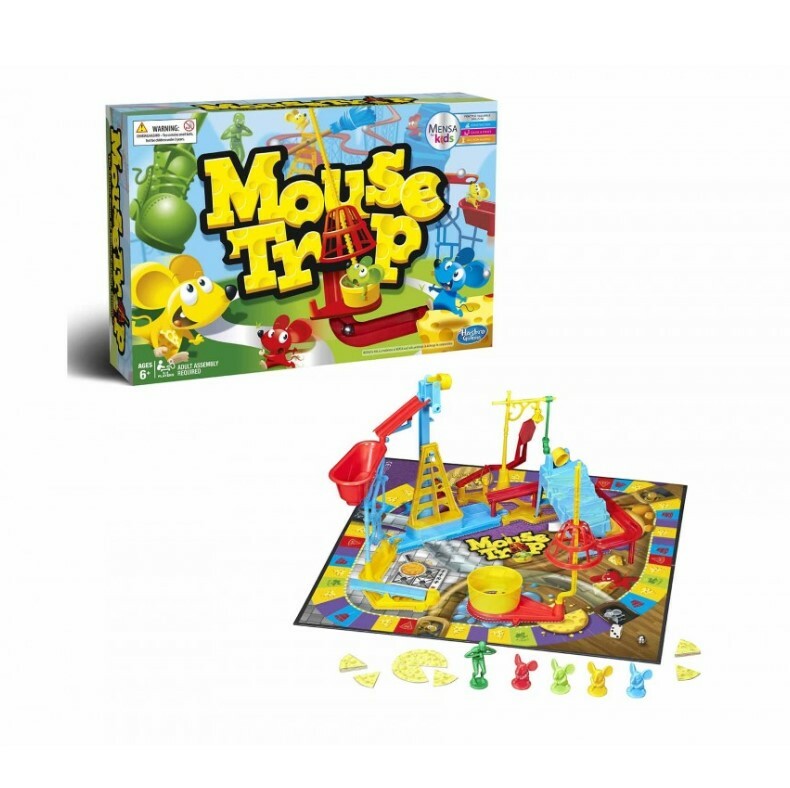 You just can’t beat a classic and family members of any age range will love these much-loved British boardgames. The perfect accompaniment to any Christmas gathering, to keep you all occupied for as long as you wish. Fancy a challenge? This Boggle Classic Word Game (£8.09) will have opponents racing against the sand timer to find words out of the jumbled letters. Up, down, this way or that, how many will you find? Got a competitive streak with your sibling that just won’t go away? Battle it out with this Guess Who Game (£14.39). Using yes or no answers, narrow down their mystery character – before they discover who you are! Any doctors in the building? The Classic Operation Game (£18.89) is one of the earliest electronic board games and a true classic. Take it in turns to play at being surgeon and operate to cure the ailing patient. The Doc with the least mistakes, wins! If it all gets a bit heated and competitiveness gets out of hand, some light-hearted entertainment should be at close quarters! Laughter is always the best medicine so ensure you relieve any family tension, so don’t let family squabbles get the better of you. The Who in The Room Board Game (£11.69) is a hilarious party game to provide you and your family with hours of amusement. With over 300 entertaining questions, players can decide ‘who in the room’ would be best suited to the scenario or description asked. For musical lovers, why not add some melodic notes to your entertainment to diffuse any strained relations? This Disney Play That Tune (£4.99 reduced to £2.70) puts you and your family to the test both in knowledge and musical skill! Take it in turns to play a tune, whilst your rival’s try and guess what it is. With 60 songs to choose from, you’ll have no difficulty in re-discovering the humour together. And if all else fails, use the Whoopee Cushion Practical Joke (£1.99) to lighten any mood and alleviate the festive stress. It wasn’t me! Media information provided by Famous Publicity. For further information please contact Josh Balmer at josh@famouspublicity.com or Tina Fotherby at tina@famouspublicity.com or call the office on 0333 344 2341. Henry Ryman opened the doors of his first shop on Great Portland Street, London in October 1893. 125 years on, Ryman Stationery continues to provide essential stationary items and unrivalled product knowledge, range and service to its customers. In 1995, successful businessman and star of BBC TV’s Dragons Den, Theo Paphitis, bought the company. Ryman offers an extensive range of school, university, office and home products which includes stationary, office supplies, technology and office furniture. This press release was distributed by ResponseSource Press Release Wire on behalf of Ryman Stationery in the following categories: Children & Teenagers, Men's Interest, Entertainment & Arts, Leisure & Hobbies, Home & Garden, Women's Interest & Beauty, Consumer Technology, Business & Finance, Education & Human Resources, Media & Marketing, Retail & Fashion, for more information visit https://pressreleasewire.responsesource.com/about.